Last night I took my son to a fast food place called The Pita Pit on Northfield Drive in Waterloo, Canada. It’s close to our house so we go there often for a bite to eat. I also brought my filled loyalty card – you buy 12 Pitas and you get a free one. When I went to use the card the cashier told me that the manager told them not to take the cards anymore. She told me they were old, though mine was started in May of this year. When I asked to speak to the manager they told me she wasn’t in. They also told me not to bother; she always won arguments so I wasn’t going to get anywhere. This company made me a promise, a contract if you will. I purchase 12 pitas and I get a free one. Then they unilaterally, with no notice, breached that contract. And what’s more, they tell me essentially that I the customer am wrong, so don’t even bother arguing the point. I don’t have time for places like that. There are plenty of restaurants, and I’ve lost my taste for places that don’t care about their customers, like The Pita Pit. Now that the Canadian dollar is at parity with the US dollar, Canadians have the luxury of shopping across the border where they find much lower prices for the same goods, and a much wider selection. This has led to exhortations from Canadian retailers that people should be shopping at home rather than south of the border. Prices in Canada have always been substantially higher than those in the US even without the additional 14% tax yet most Canadians weren’t aware of how much they were being overcharged, except in the case of bookstores where both prices are actually printed on the cover. I do most of my shopping in the US, yet it isn’t the lower prices that attract me. It’s two simple numbers – 34 and 29. I’m on the shorter side in height at 5’7", and I wear jeans with a 34" waist and a 29" length – 34×29 as the jeans would be labelled. But there is nowhere in Canada where I can buy those jeans. 34×30 is the closest I can get, and they are just too long. As fas as I know the average height in Canada is not more that the average height in the US, so why are people my height discriminated against? Fortunately I was able to purchase them online. I got two pair in my size for less than I would have paid for one pair in Canada if I could have found them, even after paying a ridiculous 30% in taxes. It isn’t just that. Canada is dominated by a few large retail corporations and the product selection is very limited and similar from store to store. For example, there are no official retailers of Sperry TopSider shoes. So Canadians have much less selection than their American neighbors. And for what they do have, the prices are much higher. In the case of the Sperry TopSiders that I wear, and purchased for $50 at Nordstroms, the best deal I’ve seen in Canada was at a generic "factory outlet" shoe store for $90. So given substantially lower prices, vastly better selection, and lower taxes, what incentive is there to shop in Canada? And in my case, what if it isn’t even possible to purchase what you need? It’s one o’clock on Tuesday morning and I notice an ad on Facebook – Air Canada is offering unlimited travel for $499. 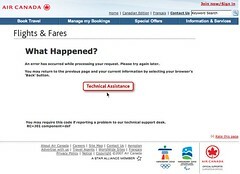 So I hop on over to the Air Canada website to check it out. There is indeed an item on the main page offering unlimited travel for the price of a single ticket but there is no other information; just a Buy Now link. So I click it and I wait. And I wait. And I wait. Fully five minutes later I click refresh, only to receive the Technical Assistance message you see here. Clicking on the Technical Assistance link just takes me to a page that tells me that I can phone Air Canada – the thing I was trying to avoid in the first place. There doesn’t seem to be anyplace else to find information about this offer either, so I really have no idea what this offer entails. Air Canada just blew off a customer ready to buy two of these tickets.And if they think I’m going to bother sitting on hold waiting for customer service they’re wrong. After all, I do have a choice in air travel. So here’s a recommendation for the future if anyone at Air Canada is listening. Before you force me into your ecommerce system, give me the information I need to make an informed decision. Then I’m more likely to forgive you and come back later. A year ago tonight my wife and I had dinner at Bloomingdales on Fifth Avenue in Manhattan after a pleasant day of shopping, and no we did not start at 5 am. Circumstances kept us from being there this year, but we miss our friends and we’ll certainly be there for Thanksgiving next year, if not sooner. ATTENTION ! Security Center has detected malware on your computer ! But I got this message on my Mac. These folks might want to invest a few minutes to actually do a platform check so they don’t come across as obvious spam. Is this how EBay intends to monetize Skype? Facebook has been painfully slow over the past couple of days. 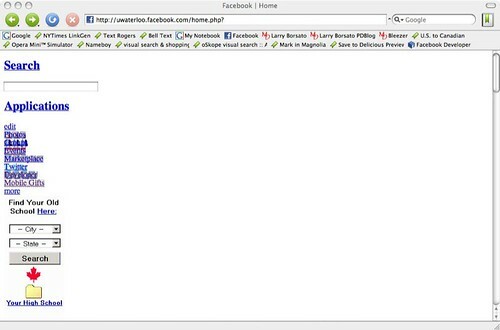 The picture below is what I actually saw when I went to my Facebook homepage today. This is the kind of problem that fast success brings – scaling problems. And pain for your average user. When you are writing Facebook applications and a single Facebook API call is taking at least 250 milliseconds, then this is a huge problem. Of course I notice that the ad is still served up just fine even if the page is otherwise useless. I don’t want my ducts cleaned thanks. Yet I get calls all the time offering me some special on having my ducts cleaned. But today was a first. A gentleman with a very heavy Indian accent called around dinner time. He told me that his name was Gerald Jones, and that he was calling on behalf of Blackwell Duct Cleaning, and they would be in my area. I guess that these people can’t be bothered to call me themselves, but if they think that I’m dumb enough to believe that the man from the Indian call center is named Gerald Jones, then they’ve got another thing coming. Though either way my answer will still be no. When I moved to Waterloo, Canada a while ago the city was considering building new branch libraries and increasing the size of the main branch of the Waterloo Public Library. At the time I thought that RIM Park, on the east edge of the city, was a perfect place for a library. The head librarian explained it wasn’t a good site because at the edge of the city it did not have an effective radius of customers to serve; the branch needed to be closer to the center of the city. But in a report to the city, the library said the RIM Park location was more convenient and more people would likely support building a library next to a recreation facility, than near a school. The park and the school are right next to each other at the absolutely most distant corner of the city. I’m not even sure that there is a bus route there, so driving is likely the only option except for the closest houses. There is nothing convenient about either location. Now at the same time a large Canadian supermarket chain, Loblaw, is planning to close a Zehrs store at the more centrally located Conestoga Mall in order to open a new superstore. Nobody wants this store but it will likely happen anyway, and the Zehrs will sit empty. Given the timeframes involved, why doesn’t the library consider the possibility of locating in the soon-to-be former Zehrs store? Apart from a couple of items, I’m currently doing a little fasting – newsfasting actually. I’m a news junkie, always needing to know what’s happening. But that takes time, and sometimes I just have other things to do. So I decided to take a break for a few days. I still glance lightly at the morning paper, but a few days without newsfeeds hasn’t killed me. "The whole idea in Canada has been to try and rehabilitate prisoners if possible," Smith said in a prison meeting room. "Why shouldn’t I have the opportunity, just because I came down to the United States and killed somebody? What difference does it make? If anybody else deserves an opportunity, then I should as well–I’ma Canadian citizen." After his arrest in Wyoming three weeks later, Smith initially confessed that he had committed the murders to see "what it was like" to kill. He also asked a judge to give him the death penalty. But he later changed his mind, and Smith’s lawyers have fought for decades — with the help of the Canadian government until last week’s policy reversal — to have their client’s death sentence overturned. The emphasis is mine, but I couldn’t possibly add anything else to that.